In the 1990s, the Teenage Mutant Ninja Turtles were everywhere. Though the series got its start in the 80s, it was so popular that its presence remained in full force for years, and is one of the few 80s franchises that has retained a good amount of its popularity to this day. Also popular in the 1990s were beat-em-up arcade games. One of the most simple but fun genres in video game history, beat-em-ups made up in sheer fun what they lacked in depth. Simply make your way to the end of the level, and beat the ever-loving crap out of the bad guys, often times with a friend or two (or three). With two such popular trends, it only makes sense that they would come together. 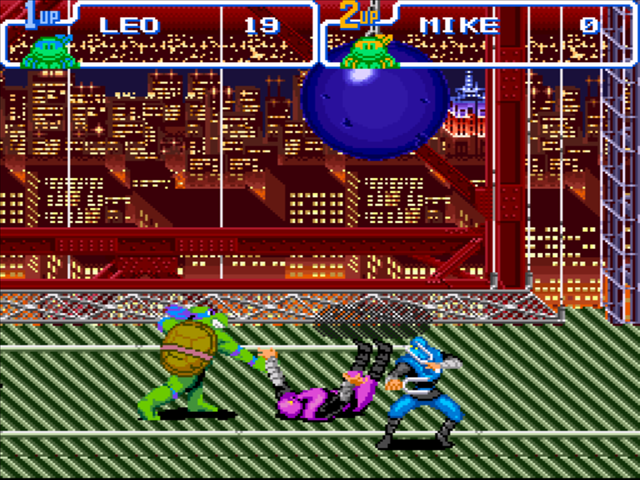 In fact, Ninja Turtles and beat-em-ups came together on a few different occasions, with none more beloved than the second such arcade game by Konami, which – in a rarity for the genre – was ported to a home console, the SNES, in the form of Teenage Mutant Ninja Turtles IV: Turtles in Time (the “IV” being added to keep continuity with the previous three NES titles). 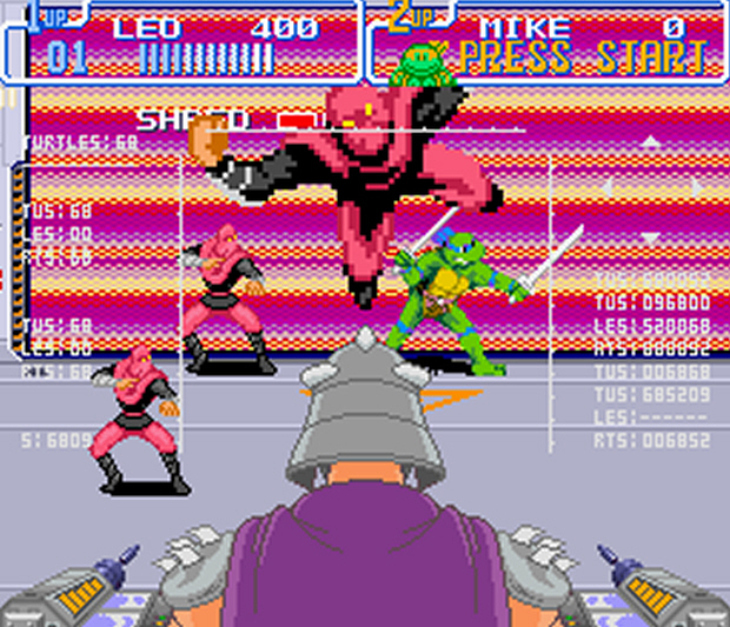 Turtles in Time was a notable title for three main reasons: for being a great beat-em-up title, for being a pretty impressive arcade port, and for being a Ninja Turtle fan’s dream, as the game includes most of the series’ classic characters (even those who have yet to appear on the big screen) as well as boasting a visual style that replicates the look of the 80s cartoon surprisingly well. 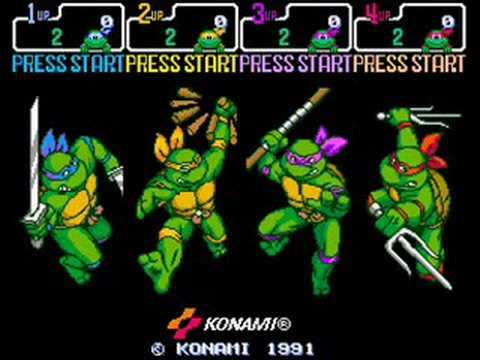 In Turtles in Time, on or two players can take control of the four different Ninja Turtles, Leonardo, Raphael, Donatello, and Michelangelo, each one using their respective weapons. Leonardo and Donatello have greater reach with their katana and bo staff (respectively), while Raphael and Michelangelo’s si and nunchaku give them quicker strikes. Additionally, you can even throw some enemies into the screen or slam them on the ground, provided you’re close enough to them. Sadly, this proves rather difficult to pull off. By attacking the enemies and stunning them, you’re supposed to press a direction on the D-pad plus the attack button in order to perform these melee attacks, but they seem incredibly inconsistent. Sometimes you’ll throw an enemy, other times you won’t. This is particularly frustrating on the boss of the game’s fourth level, as it requires you to throw enemies towards the screen. Unfortunately, this inconsistency in control isn’t limited to these attacks. Other moves are also difficult to pull off, and seem to require the player to pay attention to the character’s animations, as pressing the attack button during certain frames seems to trigger a different move. Pressing the attack button at different points during a jump, for example, can result in your turtle either doing a forward jump kick, or an ariel weapon attack. One can assume this is how things worked in the arcade, and under those circumstances it would probably work better. But on an SNES controller, it just feels off. And paying attention to character frames may work in some fighting games, but in a beat-em-up where there can be a dozen enemies on screen all attacking at once, it just gets too chaotic to pay that close attention. Now, that’s not saying that the controllers are terrible by any means, just that there may have been something lost in the translation to a home console, with the end results feeling less than ideal. Otherwise, TMNT IV is a pretty satisfying experience. You beat up wave after wave of Foot Ninjas, can interact with the environment (like breaking a fire hydrant to knock enemies down with the water that bursts out of it), and fight bosses like Baxter Stockman, Bebop and Rocksteady, and Kraang. In fact, it’s the Ninja Turtles fan service that may just be the highlight of the whole game. So many licensed games seem to get only about half of what fans love about the source material, but Turtles in Time manages to squeeze in most of namable characters from the beloved franchise (except Vernon Fenwick, unfortunately). This doesn’t just include the cartoon, but other Turtles offshoots as well. Tokka and Rahzar from the second Ninja Turtles movie of the 1990s show up, and the final battle is against Super Shredder, who also originally appeared in that film. Considering that series regulars like Kraang, Bebop and Rocksteady didn’t appear in any of the Ninja Turtles movies until 2016, it’s easy to see why any Turtles fan would have went crazy with what Turtles in Time brought to the table in the early 90s. Aside from an impressive characters checklist, Turtles in Time also did a fantastic job at capturing the look of the original series, which would definitely add to the appeal for any TMNT fan. While the NES games only barely replicated the series’ characters, the 16-bit graphics of the SNES faithfully recreate the visuals of the cartoon (one could even argue that, because the game lacks the notable animation flubs of the series, it might actually look better than its source material). It’s a game that looks like an interactive cartoon even today. We even get some great synthetic recreations of the series’ music to go with the visuals. Aesthetically speaking, a Turtles fan couldn’t ask for much more back in the 90s, and it still looks and sounds great. Aside from the somewhat inconsistent moves, the game is a whole lot of fun, if incredibly simple. Playing as the Turtles and pummeling enemies as you make your way to the bosses is entertaining. And every time you bring down a particularly difficult boss, it’s really satisfying. Though it must be said that there isn’t much else to it than that. One could argue that that’s par for the course for the beat-em-up genre, but there are other titles that prove otherwise. Guardian Heroes on the Sega Saturn, for example, threw RPG elements and branching story paths into the mix, leading to greater replay value. Turtles in Time, while fun, feels like a lesser experience by comparison. Teenage Mutant Ninja Turtles IV: Turtles in Time is a fun game, particularly with two players and, most especially, for fans of the franchise who can appreciate how faithfully it represents its material. But it also didn’t do anything out of the ordinary for the genre, and the inconsistent attacks do detract a little from the experience. A fun, satisfying beat-em-up to be sure, but TMNT IV is perhaps not quite the Turtles masterpiece it’s often made out to be. Reblogged this on Miketendo64! The Place To Go For Anything Nintendo. I just played this last week, it was really good, for both the Arcade and SNES. Oh, I remember playing this game! This was a good one. I’ll have to find it and try to play again. Great review! Thanks! It is a very fun game, especially if you’re a TMNT fan. Beat em ups and TMNT did converge perfectly at the time. I remember getting frustrated with these games until I started to play multiplayer (much much better imo) and then finally one friend used a game genie to finally get through some parts of all the tmnt ports. Good times. Excellent overview and informational writing. This is a game my friends and I will undoubtedly play together sometime soon. I’ve dabbled, but didn’t make it far while playing. The review makes me want to return to it sooner rather than later. one of my favourites on the SNES, especially because I just adored the turtles back in the day. As you said this game featured pretty much all villains, from the cartoon and the feature films, having Rock Steady, Bepop, Toka and Razar all in the same game was mind bending for me. It’s was such a nod to the fans. I do agree, the throwing mechanic, as cool as it is, was hard to pull off when I was younger. When I replay the game, it’s actually easier now that I’m grown up and wiser. I think i beat the 4th shredder level i record time once I patiently learned the pattern. I was able to throw foot soldiers at will when I play now. I’ve only sampled the Hyperstone Heist, which surprisingly had some level design differences. Game is fine, but it suffers from my general problem with most beat em ups of the time where they are a bit too simple and monotonous for my taste (Castle Crashers they ain’t). With that asides, I wonder how much enjoyment you can get out of it if you aren’t a turtles fan? I remember watching the 80’s cartoon and, to a lesser extent, the 2003 one as a kid, but I can help but feel they are very much a product of their time nowadays whenever I see footage of the show. Great review as always! Game certainly looks fun. I’ve never played it even though everyone says how great it is. Glad to hear that at least I’m not missing out on a “masterpiece,” but I still have to play it sometime!